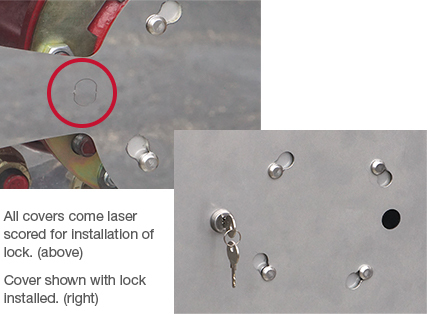 All covers come laser scored, so the lock can be added at any time. Or you can order the Aero Covers with the lock installed at the factory. 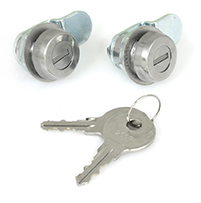 The lock engages into the Twist & Lock Bracket and allows for secure installation and easy removal of the Aero Cover. 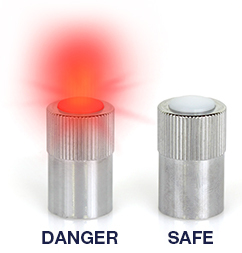 Our LED AirGuards help to quickly identify low tire pressure. In fact, every 10 psi of under-inflation represents approximately 1% penalty in fuel economy. 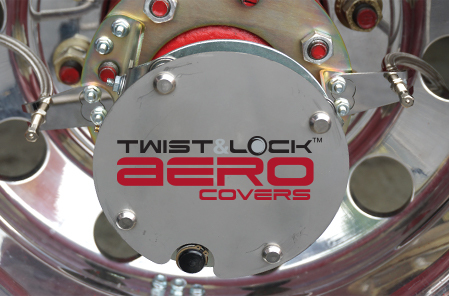 Since Twist & Lock Aero Covers are easy to install and remove, air valve extensions are not required. However, this optional kit allows for even easier and more convenient access to air valves when checking tire pressure. RealWheels is able to offer fleets and OEMs custom laser cut logos. This is a great branding opportunity and a way to really personalize your Aero Covers. Call 1-800-982-1180 for more information. The logos to the right are registered trademarks of the companies shown, and are used for identification purposes only. Realwheels Corporation and its products are not affiliated with these companies. Additionally these logos were produced for use by some of the companies shown, or as sample logos requested by the OEM companies, and are not for sale by Realwheels.